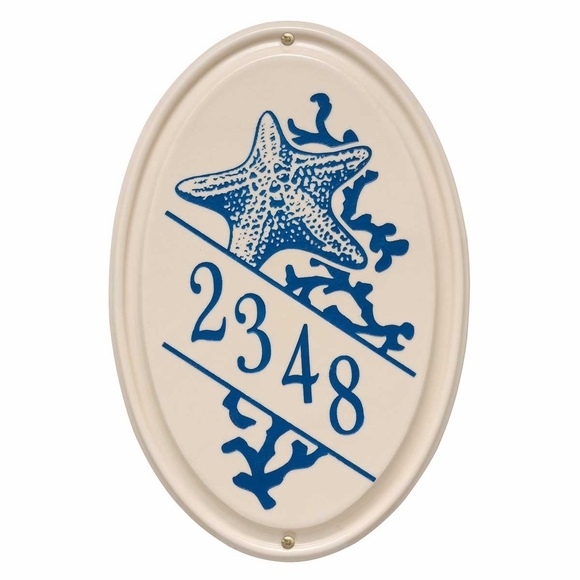 Vertical Address Plaque with Star Fish - - personalized with the house number you supply in 3" numbers running through the middle of the oval sign. Wall mount. Made in USA. Ceramic plaque has a relaxing coastal theme with the star fish sharing the stage with the address. The single line of personalization holds up to five (5) large 3" numbers. Wording and design colors (shown in small images from left to right): dark blue, green, or coral.